Observation - Single oak leaf - UK and Ireland. Description: A single oak leaf blowing around on a windy November day. Oak leaf is dark brown and has a short leaf stalk. Probably from a quercus robur. A single oak leaf blowing around on a windy November day. 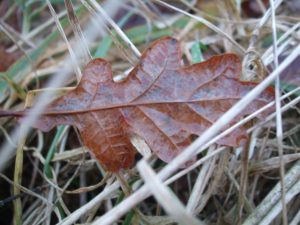 Oak leaf is dark brown and has a short leaf stalk. Probably from a quercus robur.